I have taken the 7up lesson plan and adapted it as my own to help my students expand their writing and build better sentences. I am including 2 powerpoint presentations- each with introductions about what 7up sentences are, expectations, example sentences, examples to do as a group, and each powerpoint has 20 picture sentence writing prompts. I students about how we'll be writing a lot- and what each sentence needs to have- capitals, correct punctuation, spelling, grammar and 7 or more words. I then give examples of expanding sentences- instead of writing "I play football" I encourage students to be more specific- saying "I play football for the Minnesota Vikings." I then have picture prompts asking students to come up (verbally as a group- or you could write it too!) with a 7up sentence to describe the picture. I have a bunch of examples and you can use this as needed. I then have 20 different picture prompts- where students write a 7up sentence for each picture prompt given- #'s 1-20. I like this activity because you can adapt it to make your own in any way- My students really enjoyed this! 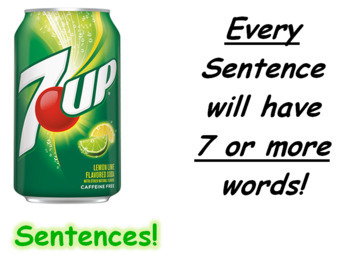 I am also including a poster I like to post around my room to remind students about writing 7up sentences! Enjoy!